Adivasi Abba Justin Lakra Memorial Football Tournament kick-started at the Bhooteachang Tea Garden playground in Udalguri on Sunday. The event, organized by the Udalguri district committee of the All Adivasi Students Association of Assam(AASAA), was inaugurated by the wife of the founder president of AASAA, Lata Tiru Lakra. games and sports in one’s life. Talking about football, which has emerged one of the most popular sports in the world in modern times, she said that many players have made their country proud by making big in this game. Lakra exhorted the young generation to hone their skills and outshine in sports activities. The inaugural ceremony was attended by Suresh Tanti, MCLA, Nonaiserfang BTC constituency, MCLA; Tinku Orang, Udalguri AASAA president, Sohrab Ali, OC, Panery PS among a host of AASAA activists. The first day match was played by Bhutiachang TE against Orangajuli TE with the game ending in tie-breaker 4-5. Both the teams were on a tie-breaker round with 1-1 goal in first half and second half. Bhutiachang TE won the inaugural match, informed publicity secretary of AASAA’s Udalguri committee Laxman Porja. 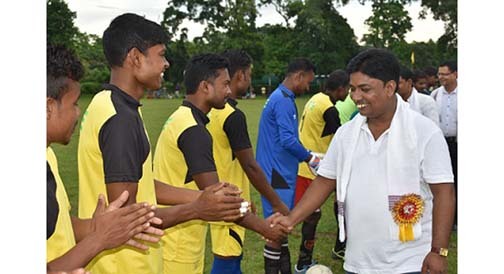 A total of 34 teams from various parts of Udalguri will participate in the tournament.